Provident fund is the right of every employee in our country. Provident fund is sourced by the employer and is often deducted from the salary of the employee. When an employee leaves a company to join another company, the employee is supposed to withdraw the provident fund. Or the employee can continue the same PF account if he joins a new company where the PF is deducted. You need to collect all the information related to the Company’s internal process of withdrawing the PF amount from your EPF account. Your employer should give you the Form 19 and Form 10 c from your employer. Fill it and send the application form to your previous employer. You need to make an affidavit for indemnity bond mentioning the reason why you did not withdraw the amount yet. You need to get this affidavit Notarised. The affidavit should be on a Rs.50 or Rs.100 Stamp paper depending upon the state. The previous employer will process it and send it to the Provident Fund department for withdrawal. You should have a savings account in any nationalised bank. You need to provide your bank details, account number, address and branch code of the bank etc. You should attach a cancelled cheque with the application form, as proof that you hold this account. Send the completed form with the attachments to your previous employer. They would send it to EPF office for processing. Also if the Company has its own PF Trust for processing, then you have to directly send it to that address. you need to confirm this with your employer. You will receive a confirmation from the PF office once the process is started. You can check online to know the status of your application. The amount would be directly credited to your bank account provided to the office. Once the amount is credited to your account by the EPF office, you will receive a message. Do you want to withdraw your PF amount soon? Then all you need to do is follow the above procedure exactly as it is! You are going to need the affidavit for indemnity bond. Good news is, you need not worry about making the affidavit. 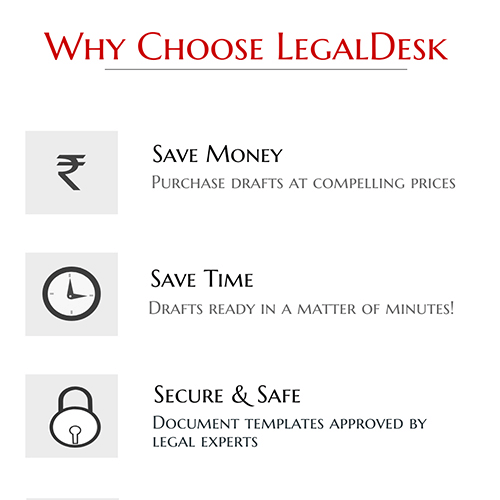 LegalDesk is here to help you create your own affidavits and legal documents. Just click on the link below to create your affidavit. We can even print it on Stamp Paper of due value and deliver to an address of your choice!